It is possible to live “the Nabucco experience” inside its four diverse rooms that comprise the restaurant and with their names – Teatro, Nabucco, Rigoletto and Aida – pay homage to the composer Giuseppe Verdi. The rooms have different dimensions to host between 10 to 30 guests depending on the room and are available for private events as well as for business dinners and lunches. 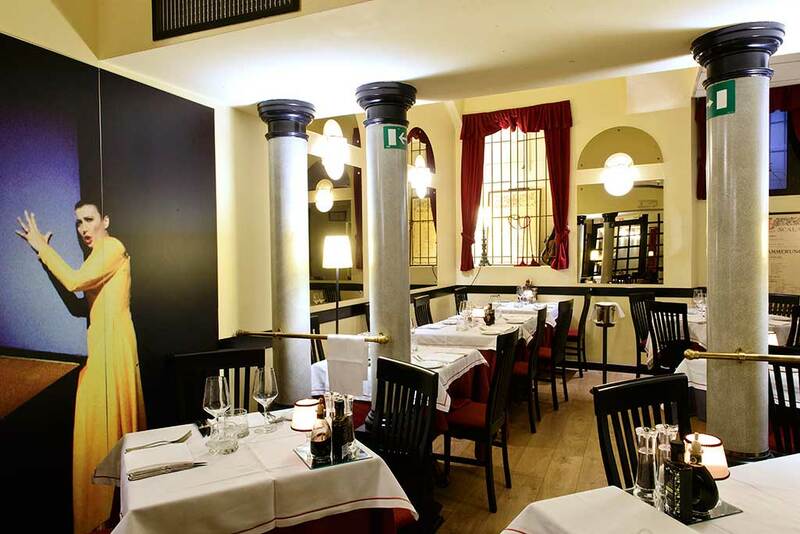 As you enter the restaurant you can see a vibrant room on the left, bordered by marble columns and overlooking the dehor and the bustling street of Fiori Chiari: it is the “symbolic” hall of the restaurant, from which it takes its name, and is inspired by the opera Nabucodonosor, signed by Giuseppe Verdi. Il buffone di corte Rigoletto – the protagonist of an opera by Giuseppe Verdi, is the character who inspired this room of Nabucco. 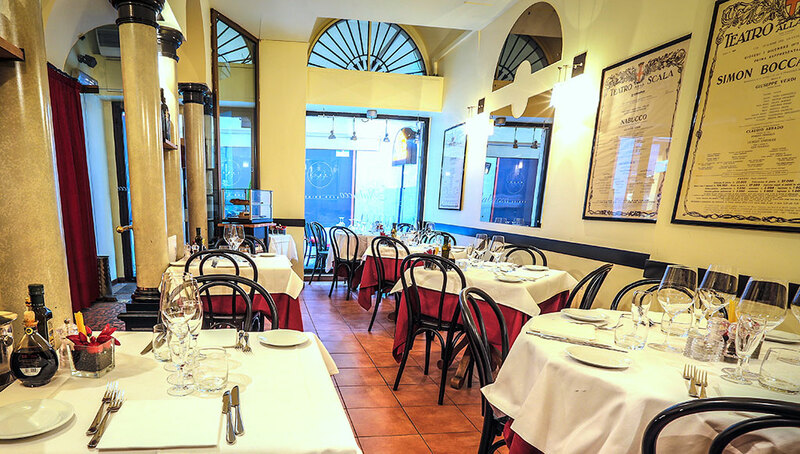 A private and cozy space, bordered by marble colonnade, ideal for business lunches and informal meetings accompanied by the best of the Italian cuisine. 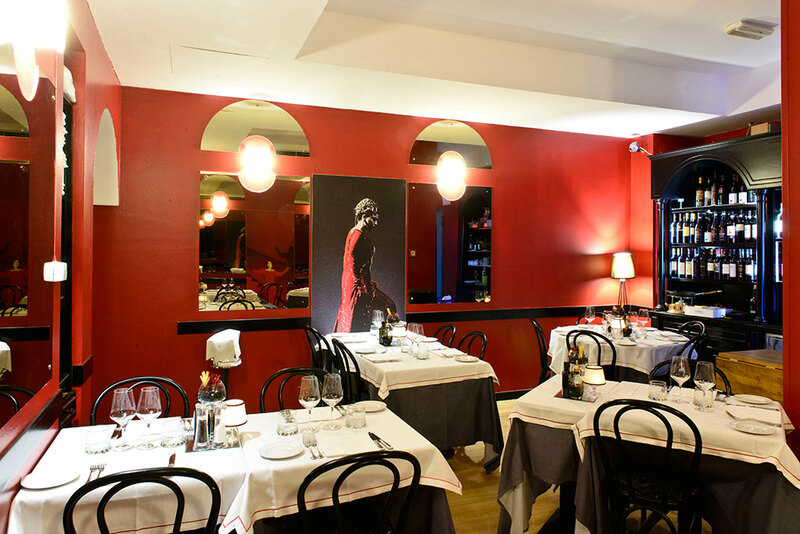 From Sala Rigoletto we pass to Sala Aida, an environment dominated by red and dark wood that recalls the atmosphere of national theaters. In this room the wines of the winery are on display; including many of the famous and refined labels, to be matched with the dishes signed by the Chef. Inspired by the foyers of the great theaters, including vintage posters and portraits of great artists, the Sala Teatro is perfect for big gatherings and celebrations.